Cylinder Bases. Lathe or milling machine? I read an expert treatise on making a double expansion steam engine, and I imagine that the comments applies to triples also. One aspect emphasised the importance of accuracy in making the cylinder bases. The parallelism of the surfaces, the concentricity of the piston rod hole and the other circular elements, and the thickness. The usual method for making these items is to turn them in a lathe with a 4 jaw chuck, then to reverse the item in the 4 jaw to turn the other face. It is possible, but very fiddly and time consuming, and relies on expertise, patience, good eyesight, and a good lathe. All of which are in short supply around here. 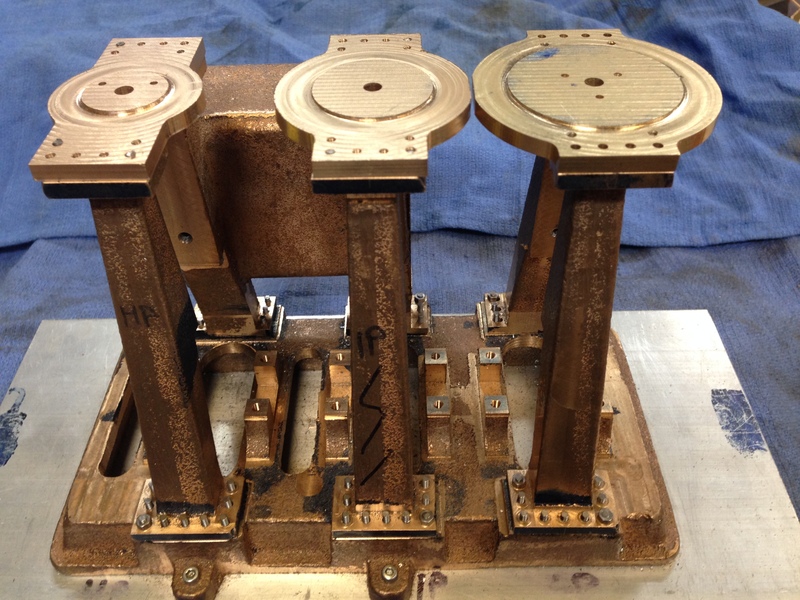 A triple expansion steam engine requires 3 of these base plates, and while there are some common dimensions, the cylinder bores are all different. Many of the screw holes are common to the 3 plates. The thicknesses are all the same. 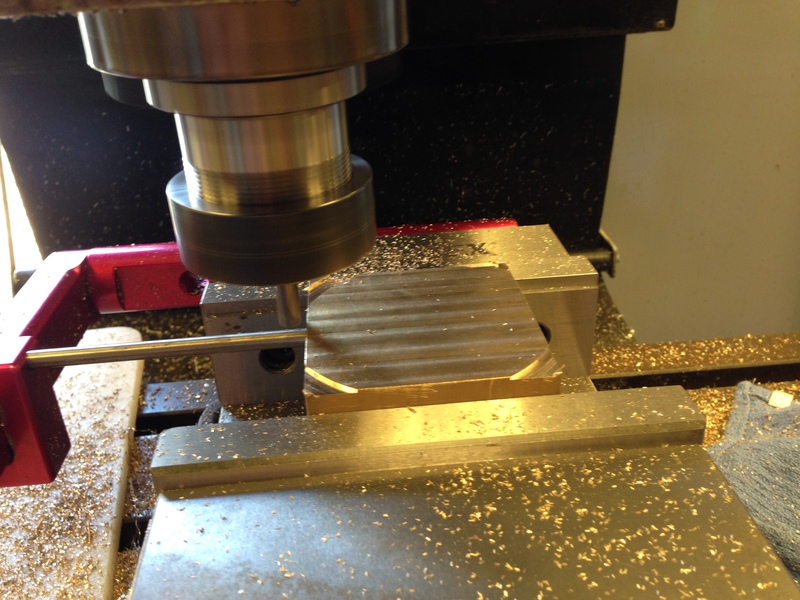 To shorten this rather boring epistle, I decided to have a go at making the base plates on the CNC mill. Given my previous muck ups, broken bits, crashes, this was a courageous decision, as evidenced by having to bin the first effort. But the next 3 all seemed to work OK. First I studied the plans and noted the common elements, then I made a jig, with holes drilled at the common positions. The underside of the jig, showing the 5mm centre hole and the counterbored holes at the attachment points. The topside of the jig, after the first and second baseplates were drilled, thicknessed and shaped. The jig needed to be made very accurately, to retain position of the workpiece after it was reversed, so both faces could be milled. I am told that CNCers build up a collection of jigs over time. They are rarely used again. 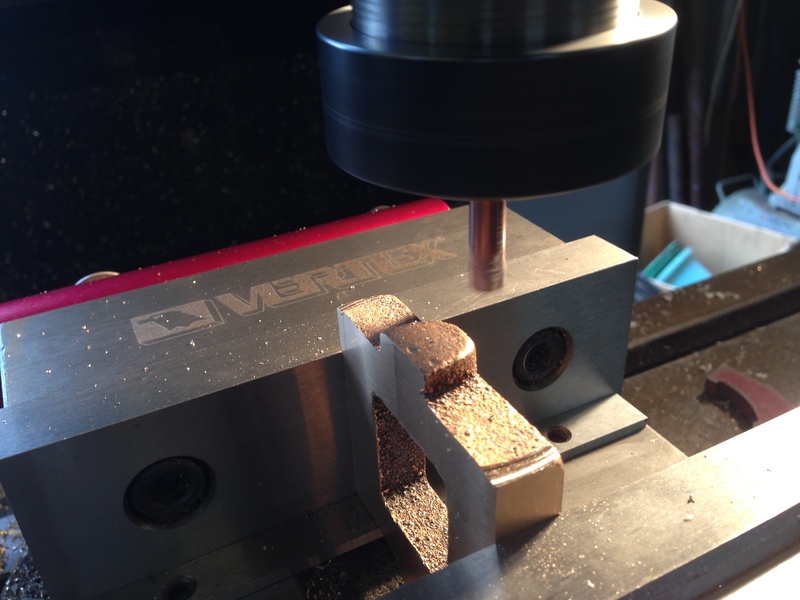 CNC milling the central boss. 20.48mm diameter, and accurate. Note the red positioning device, enabling the workpiece to be removed to check measurements, then replaced exactly in the same position. The cylinder baseplates screwed to the columns. Some trimming of the column tops is required. The baseplates are centered accurately, as far as I can measure. Note that the central jig separating the columns has been removed, and the baseplates are now holding the column tops in position. The columns appear to be lining up correctly. 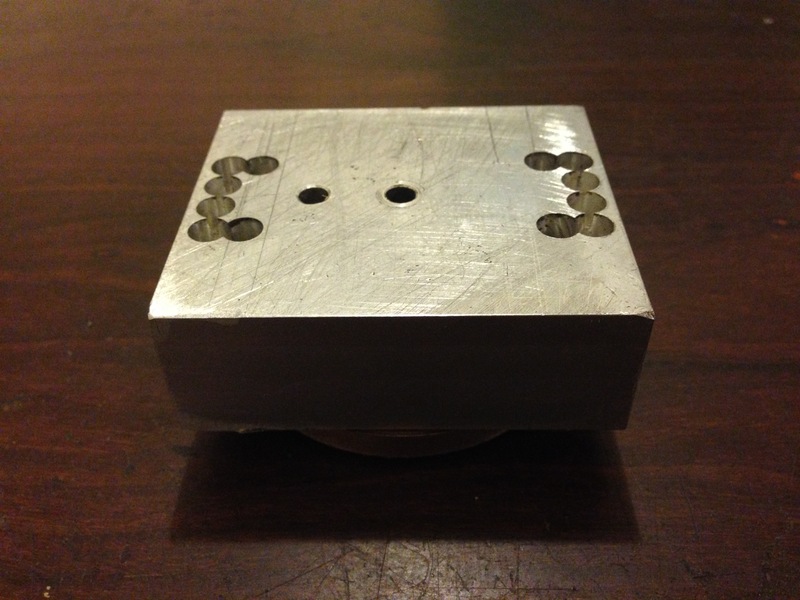 The next example of using the CNC mill to perform a task which is normally done on the lathe. The mill cutter is travelling in diminishing circles, producing a central boss, and a flat surface. The boss finished to size (10mm dia) and flat surface. BTW. In a previous post I mentioned a 1 mm inaccuracy in a CNC milled part. 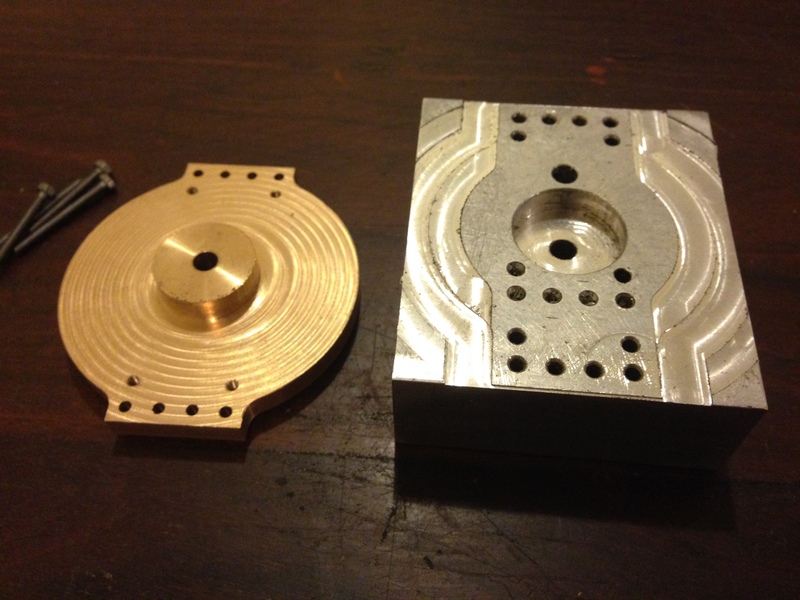 It happened again when I milled the first base plate, which ended up exactly 2mm smaller than programmed, and had to be re-made. This time I discovered the cause of the inaccuracy…. I had used an 8mm milling cutter, but had forgotten to tell the CNC computer that I had changed from using the 6mm cutter. The CNC machine did not notice the change, and cut the part exactly as instructed, very accurately, 2mm smaller than intended. 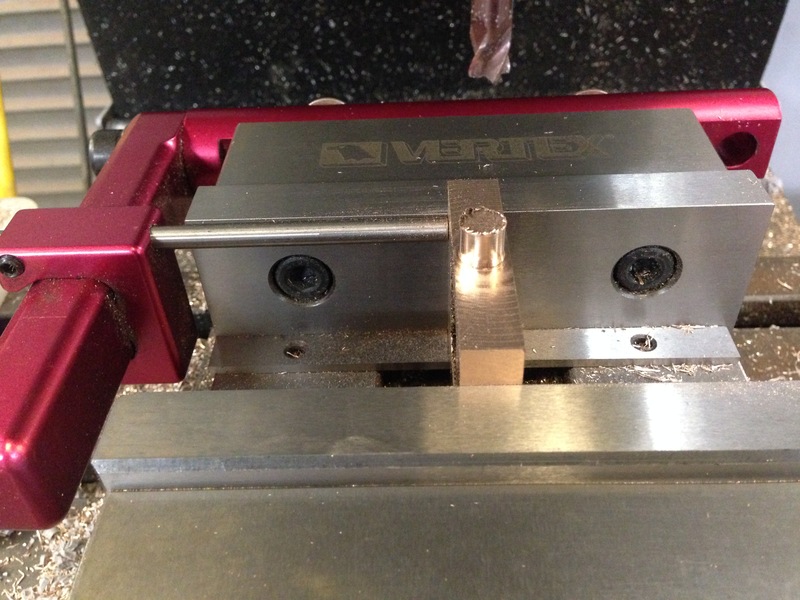 CNC machines are incredibly clever, but very very dumb. They do exactly as instructed, even if the instruction is wrong.